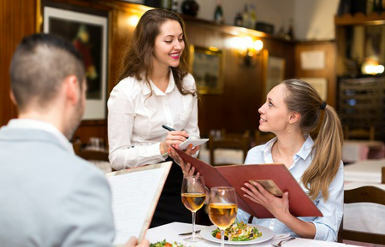 Do you know what to say when you are eating out? Below there are some examples of useful language used in this situations. In groups, translate these expressions and add them to the vocabulary list for your study. 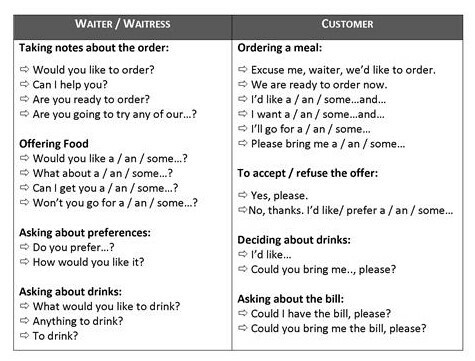 B) There are sentences commonly used in a restaurant when ordering a meal. Put the words in the correct order. 1. pay / can / with / I / a debit card? 2. a table / we´d / like / for two. 3. have / the soup of the day / first / I´ll. 4. the menu / have / please / we / can? 5. have / please / can / the bill / we? 6. vegetables / what / like / you / would?